You all know we love a good book round up for the holidays, so here is a list of thirteen of our favorite Halloween picture books. A cautionary tale wonderfully illustrated by Tony DiTerlizzi in black and white, which lends a sense of foreboding to the entire book. A perfect Halloween read. 2. Tilly Witch by Don Freeman. Published back in 1978, this is one that I remember enjoying as a child. Tilly is the Halloween witch and, right before Halloween, loses her meanness and has to go back to school to relearn the tricks of her trade. It's no longer in print but is available inexpensively from third party sellers. We fell in love with Finnigin, his eating stool, his eating spoon, and his gigantic eating mouth upon first read. It is a seasonal must and as it goes with kids sometimes a non-seasonal must read as well. Such a classic, we have read this one over and over and over to the delight of my children. We also like to watch the animated movie, both the book and the movie are so well done. Funny with just the right amount of suspense. Creepy Carrots is a home library necessity. Frighteningly good. Yes, we just went there with the puns. A book that combines a visitor from outer space and Halloween? We're in. This humorous tale of an alien visiting Earth for the first time during the fun and festivities of trick or treating is a classic and if you are a child of the 80's, it is sure to bring on some nostalgia. If your kids enjoy Monster Goose, then I highly recommend Monster Museum. There's a poem for just about every Halloween ghoul, they are witty and entertaining but just a tad on the long side. The illustrations really make this book. I only recently discovered this ghost story and it's fantastic for younger children. A young girl moves into a haunted home- but she knows just what to do! I love the simple, bold illustrations and light hearted story. A genuinely sweet Halloween story that I would recommend to anyone. This is definitely for the under 6 years old crowd, but hits all the right Halloween notes. A graveyard comes alive with everyone playing their part and eventually the town joins in the party. With lots of sound and movement, this is a fantastic introduction to Halloween for preschool aged children. A witty parody of Madeline that will have fans of that story delighted by the Halloween theme of this one. A favorite of my daughter's. We love a good pop up book and pretty much anything by Maurice Sendak. A small boy is in search of his mother and no monster is going to stop him. Fun and beautiful, both my children love this book. 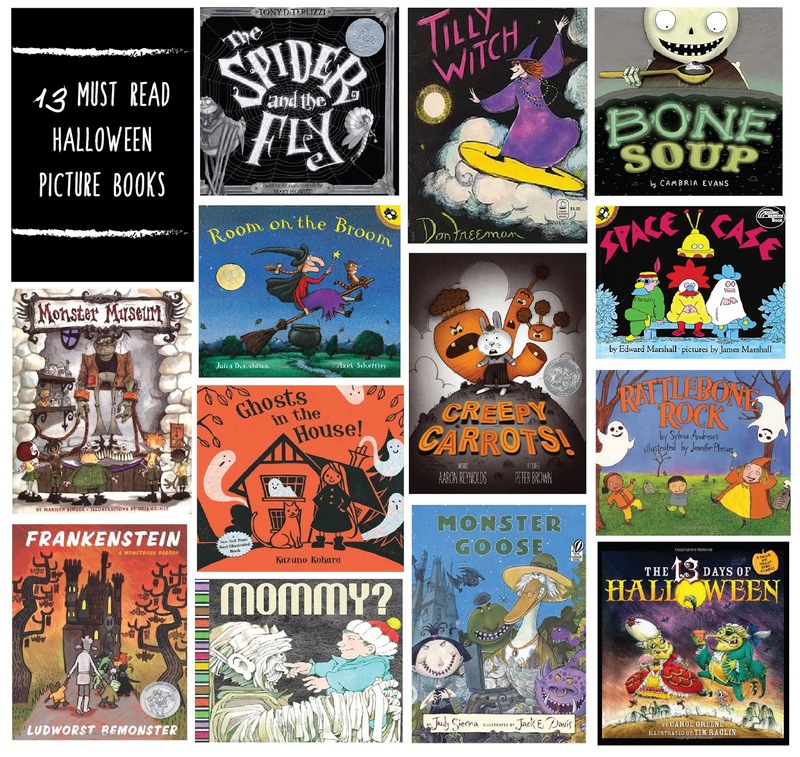 All of your favorite Mother Goose nursery rhymes get a Halloween makeover. It's a tad on the grisly side, both the verse and illustrations, so if you're sensitive to creepy, crawly things this may not be your cup of tea. 13. The 13 Days of Halloween by Carol Green. A parody of the 12 Days of Christmas, The Thirteen Days of Halloween is a wonderful sing along story that is both clever and catchy, and one that even slightly older children will enjoy. A fun addition to anyone's holiday library, the illustrations are especially nice.